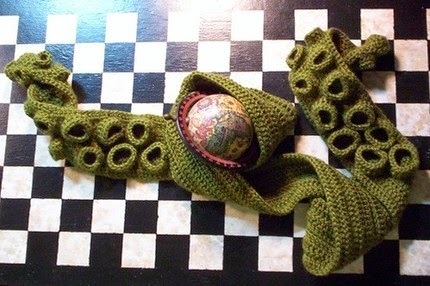 I once saw a scarf on Esty that looked like tentacles. I looked and looked and couldn't find the one I saw again. So I made one. I wish I could find my inspiration for you, though. Cephalopods are some of my favorite creatures. I especially like their appendages and color-changing skin. I just knitted a fairly long scarf out of wool yarn with tapered ends and then added crocheted circles to look like suckers. 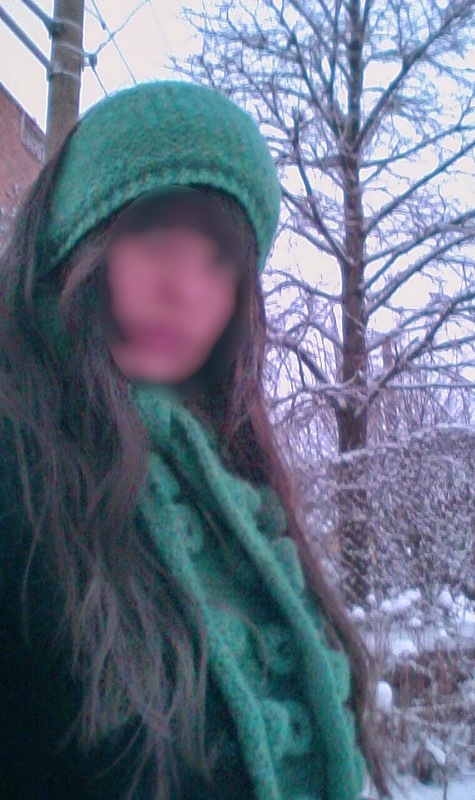 I was not so smart, and made my scarf in stocking knit. This meant that it rolled up every time I tried to put it over my ears. Lame. So I fixed it somewhat by adding a layer of super-soft, purple minky. Now it is twice as warm when I wrap it around my ears! Spring is right around the corner, and as much as I love my scarf, I'm getting a little sick of skidding on ice... I still love the snow, though! I found my inspiration picture! skills! <3 it and it looks awesome on you.